Saturday is my husband’s birthday. He will be 39. 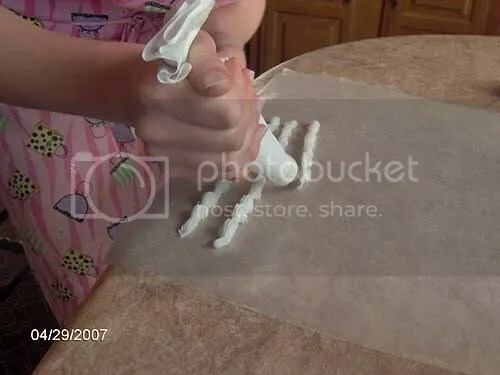 The daughter wants to decorate a cake for him for his birthday. 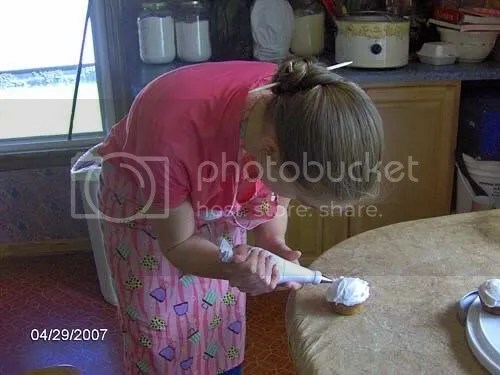 She has never decorated before, so I suggested to her that we make cupcakes, and she practice on them. 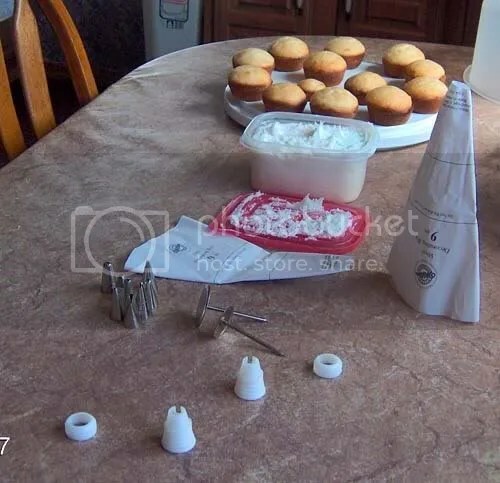 That way, each cupcake could be a different technique/tip, and she wouldn’t be so overwhelmed with a huge cake to decorate. So that is what we did. The ingredients were assembled, and I showed her an easy way to hold up the bag as you are filling it. We only decorated with white icing, so that if mistakes were made, they would be easy to swipe off, and colors wouldn’t bleed on the base. 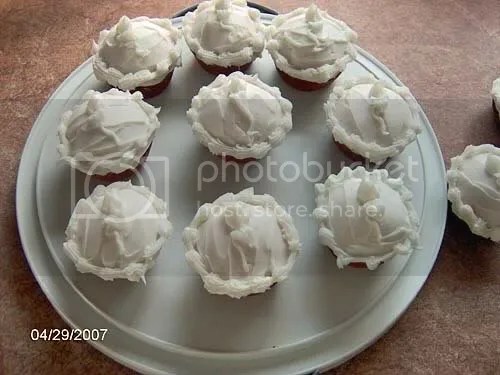 First we iced the cupcakes. The icing wasn’t home made decorators icing. 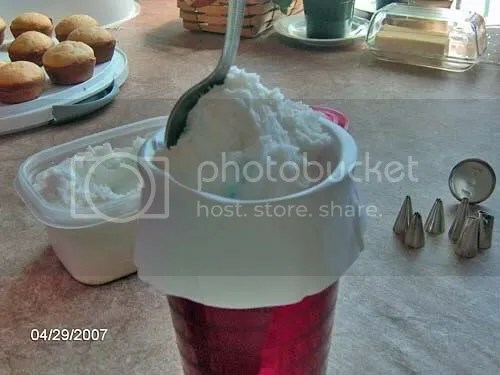 The husband has a second job at Walmart, and from time to time he brings home a few 3 gallon icing buckets that they use in the bakery. Did you know that they leave a good 3-4 cups of icing in those buckets? Did you know that I am frugalness personified?? I get my bowl scraper, and clean those out. So the icing we used was Walmart butter cream icing. So it was a bit soft, and not easy to make smooth. We need to decorate them first, silly girl! I then laid down a piece of waxed paper for her to practice on. She realized quickly that it isn’t as easy as it looks. By this time, she was getting tired. So I ended up decorating them………all! You really can’t tell what they look like since they are all in white, but there are rosebuds and a stem and a leaf. Guess who is decorating the husband’s birthday cake??? Do you decorate cakes for birthdays? do you get one at the store, or do you make a pie instead? I found another cool way to do the daughter’s hair. 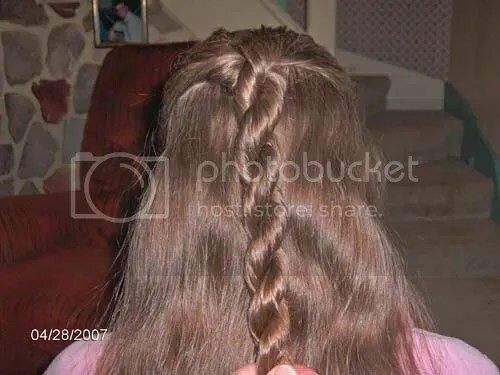 It is called a rope braid. I have seen them before, but I had never known how to do one till now. Isn’t it lovely. See that gorgeous color of hair. I prayed for that hair. When I was pregnant for my daughter I prayed for 2 things for her. 1. her hair would be the gorgeous shade it is, and 2. well, she would be so totally embarrassed if I said what the second was, so I will respect her and not say. However, I can be bribed! Today, in my quest for a lusciously green and dandelion free lawn, I went on a kill. 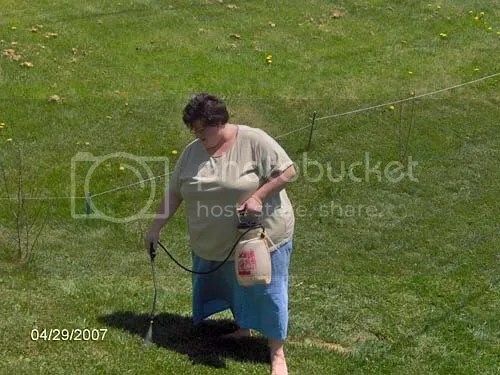 As you can see, my neighbor’s lawn is sprinkled with those lovely yellow flowers. So, why don’t I want them in my yard? Well…….because I am vain. 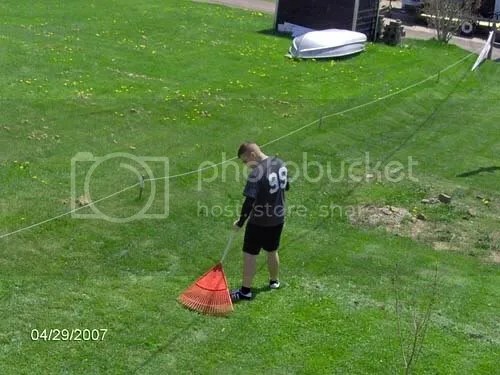 I want other’s to look longingly at my lawn, like I have so many other’s. I’m not proud of that, but there you have it! I have also drug my son into my vanity. I should be ashamed, but I am not. I went to bed early last night because my favorite piece of furniture,was calling to me, actually it was screaming for me, and I just had to answer the call. 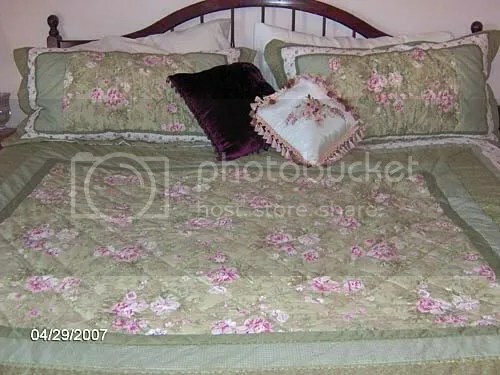 Every night when I crawl into bed, I either say out loud or think to myself with a big contented sigh “I love this bed”. The husband usually grunts in agreement, or has already succumbed to it’s powers and is snoring away. Growing up, being the oldest, I was privileged enough to have a double bed. The sister, she got stuck with the single jobbie. When I got married, I just didn’t want to have to share all that lovely space with anyone. I was used to sleeping smack dab in the middle of the bed. Who wants to give all that up? Not me, I tell ya! So, we solved the problem by getting a King size bed. Everyone needs a King size bed. Go get one today. You’ll thank me. Really…….you will! Posted on Sunday,April 29, 2007 Sunday,April 29, 2007 16 Comments on April 29th. Not blogging tonight. I am going to bed…………early!!! Here is a picture of the back of the daughter’s hair. I cut it last night, and found a new way to braid it, so she doesn’t look like a 9 year old. 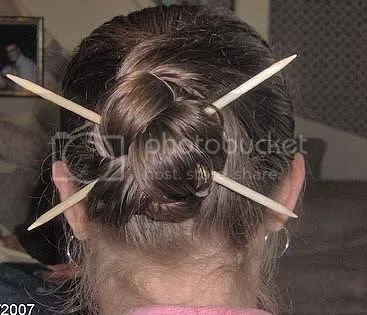 Then I put it in a bun, and held it in place with a set of my wooden knitting needles. It looks so cute! I spent a good amount of time on the phone today. Mostly with my sister. I rarely get to chat with her anymore. She is always so busy, but she took some time today just to chat with me. It was so good to talk to her. Growing up, I was an awful sister. 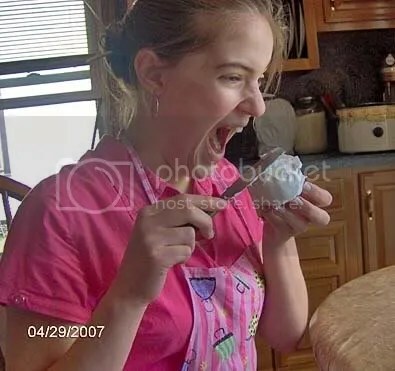 I was such a bully. I know…….I know, you wouldn’t dare think of me that way now, but back then……yes, it is true!!! We were always there for each other too. Water….the lifeblood of man……..but when you are drinking gallons of it a day, you begin to loathe the sound of it. I am fighting a UTI, and I think if I have to drink another drop of that stuff, I will lash a spear to a tree and impale myself. I know that you are all sitting there, waiting with baited breath just to know how much I have progressed on my knitting, so I won’t fail you. I can not fail you, loyal readers…….here is my progress!!! I cut the daughter’s hair this evening. I cut about 6 inches off the back. She wanted all her layers off, so I obliged her. It looks much healthier now. I love doing little things like that to please my kiddos. What do you like to do to please others? Where has this year gone? Do you realize that we are 5 days away from a quarter of the year being GONE??? Well, yesterday I told you I had to knit something pink or I would go insane. 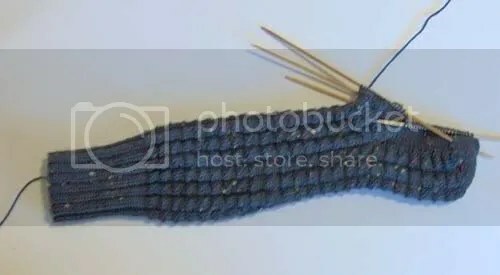 Well, after working for 2 ½ hours~~½ of that was spent unknitting and trying to figure out a pattern~~I have this much done. 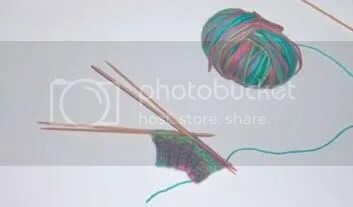 I am not a fast knitter, but in my defense, the daughter asked me to sit in the kitchen with her while she made potato salad,~~Aunt Cindy’s of course~~ the husband was chatting with me, and then I screwed up the pattern BIG TIME!!! There is about an inch and a half there……..and you know what is best of all???? It has pink in it!!! It is so delightful to knit with these colors…soothing on the eyes. In other news….do I have other news? No…..I am a boring person. Boring people don’t have news. I did have a wonderful talk with my son tonight, and he told me that he thought that I raised him just exactly how all kids should be raised, and that he stores little things in his head so that he can do it with his kids, and that he hopes that he is able to raise his children as good as I raised him. I tell you that was music to my ears!!! It TOTALLY made my day…..week………year……..life!!! I ate a blueberry muffin this morning…..Jiffy mix. Jiffy mix are my favorite kind of muffins. I remember going over to my Aunt Cindy’s house when I was a little girl, and she would fix hot dogs and Jiffy corn bread muffins. I always thought that was THE greatest food. Such a treat for me!!! Now she makes the best peanut butter fudge and potato salad. Bet’cha all thought that I had given up on it, didn’t you??? I haven’t. I did set aside for awhile because this gray is just so depressing. The weather is getting better, so I thought that I would work on it again. I thought…hey! it is gorgeous outside, maybe the gray won’t look so depressing in the sunshine…….WRONG!….all I got for my efforts was a sunburn on my arms! 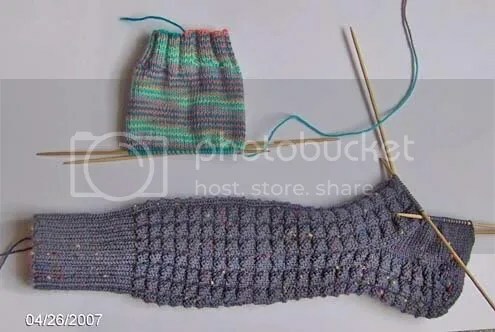 There are 2 things I love about this pattern, one is the fact that it decreases for the ankle part, and the second is that it continues the pattern on the back of the heel. It is soooooo cool!!! I need to finish this….only I don’t think I am going to do it’s mate right now. I MUST…MUST…MUST knit something in pink or I will go insane. I need a happy color……and pink is my happy color!! !